Senate Asks Governors For Advice In How To Fix Health Insurance : Shots - Health News Senators holding hearings this week are looking for quick tweaks that will stabilize the insurance markets and make policies cheaper. Some governors want more federal money and more flexibility. 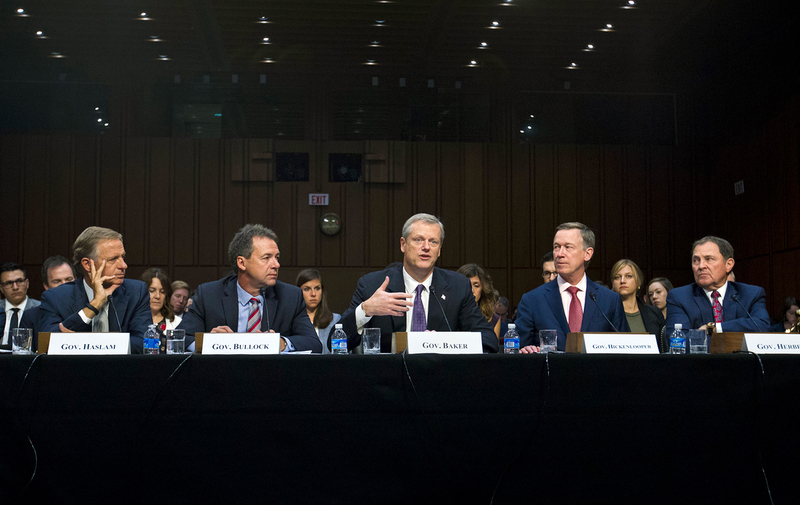 Governors from left; Bill Haslam of Tennessee, Steve Bullock of Montana, Charlie Baker of Massachusetts, John Hickenlooper of Colorado and Gary Herbert of Utah all testified Thursday about ways t improve the ACA. Sen. Lamar Alexander, R-Tenn., is leading the effort to stabilize the Affordable Care Act's insurance markets for next year. He's trying to get a bipartisan bill together in the next 10 days, he said Thursday. He's working against the clock; insurance companies have only until Sept. 27 to commit to selling policies on the ACA exchanges, and to set their final prices for health plans. It's a big ask. And Alexander, who is chairman of the Senate's Health, Education, Labor and Pensions Committee, was frank about what needed to happen. "To get a Republican president and a Republican House and a Republican Senate just to vote for more money won't happen in the next two or three weeks, unless there's some restructuring," he told a group of five governors who testified before his committee Thursday. It was the second of four hearings the committee is holding while developing a new health bill. All of the governors and most of the senators in the room agreed that the top priority was for Congress to appropriate money for what are called cost-sharing reductions. These reimburse insurance companies for discounts they're required by law to give low-income customers. President Trump has threatened to cut off the payments, and insurance companies have responded to that uncertainty by proposing higher premiums for next year. Funding CSR's is the easy part, Alexander said. He was looking for tweaks that will appease conservative Republicans who for years have told their constituents that Obamacare is a failure. They would be hard-pressed to appropriate money to fund it without some substantive changes. Alexander presented the dilemma to the governors as an opportunity to ask for specific changes they'd like to see happen fast. "This train may move through the station, and this is the chance to change those things," he said near the end of the hearing. "And so if you want to tell us exactly what those are, and we got it by the middle of next week, we could use it and it would help us get a result." The governors had plenty of ideas. Massachusetts Governor Charlie Baker, a Republican, said establishing reinsurance plans — pools of money to help insurers when they face huge costs from severely ill patients — can cut premiums for everyone. Alaska last year created a reinsurance program that almost immediately slowed down the inflation in health insurance premiums in that state, Lori Wing-Heier, the director of the Alaska's Division of Insurance, told the committee in testimony Wednesday. Democratic Sen. Maggie Hassan of New Hampshire thinks Washington should put up some of the money for such programs. "I'd be making the argument that at least some of the seed money should be coming from the feds because the feds are going to save money," she told the governors at Thursday's hearing. And the governors unanimously supported Alexander's proposal to give states waivers that would allow them out of some of Obamacare's regulations, and enable states to design their own health care systems. "What we're really focused on is, how do you make the bureaucracy easier so that you can get these various waivers that pretty much all of us agree offer not only cost savings but in many cases will improve the actual outcomes of health care delivered," Gov. Steve Bullock, of Montana, told the committee. Sen. Chris Murphy, D-Conn., said he was concerned that giving too much flexibility would diminish the quality of the insurance policies. Gov. Bill Haslam, of Tennessee, took issue with that. "There's an assumption from the federal government, that's a little offensive to be honest, that 'you won't care for the least of these unless we tell you exactly how to do it,' " he said. The governors were divided on a suggestion by Alexander that catastrophic health plans — which have high deductibles and don't cover routine health care — should be more widely available. Under the Affordable Care Act such policies are only available to people under age 30. Alexander said expanding the role of such policies could help gain the support of conservative Republicans in the House and Senate who want consumers to have more and cheaper choices in their insurance plans. Baker, of Massachusetts, said he opposed expanding such policies, but Gov. Gary Herbert of Utah said he liked the idea. In the end, Alexander suggested the bill he'll pursue will likely include funding for cost-sharing payments and a more flexible waiver program. But he says he's open to ideas. "The reason for the hearings is for me to learn and listen," Alexander said.